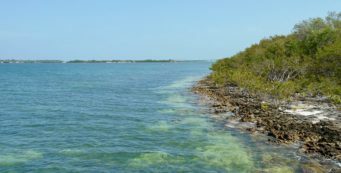 Florida Keys | Florida Hikes! 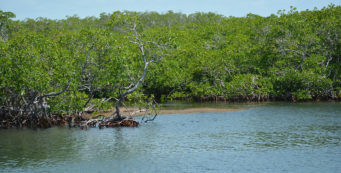 Outdoor recreation in the Florida Keys introduces you to the most tropical and unusual habitats within the United States. 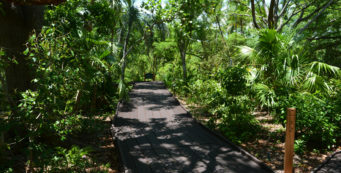 It truly is like being in the Caribbean, with tangled jungles of tropical trees and mangrove-lined waterways. 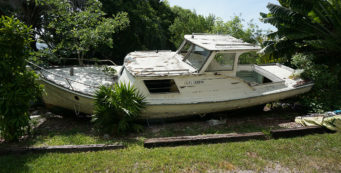 Some destinations are accessible only by boat, while others are right along US 1, the Overseas Highway. Bahia Honda Beach Walk- Connecting Calusa Beach to the Atlantic Ocean, this shoreline walk at Bahia Honda State Park provides scenic views and a close examination of the historic Bahia Honda Channel Bridge from below. 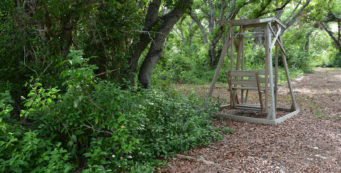 Crane Point Hammock- Part native, part cultivated, Crane Point Hammock is 63 acres of tropical hardwood hammock in the heart of Marathon. 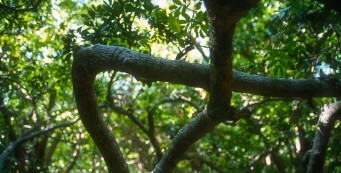 Preserved from development in 1989 by the Florida Keys Land Trust, it is the largest tropical hammock in the Middle Keys. 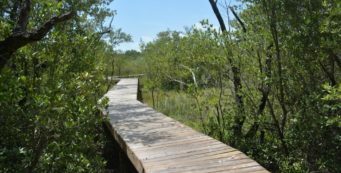 Curry Hammock Nature Trail- For an immersion into a tropical rockland hammock and its rare bounty of Florida thatch palms, explore this short but rugged and fascinating loop along the bay side of Curry Hammock State Park. 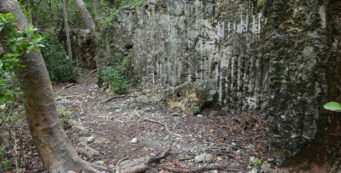 Flagler Quarry Trail- A short interpretive trail at Windley Key Fossil Reef Geological State Park, the Flagler Quarry Trail leads you around the showiest of the quarries and the ruins of the railroad depot. 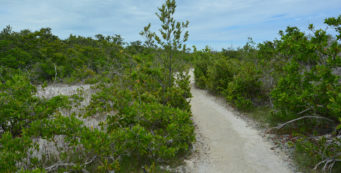 Fort Zachary Taylor Hiking Trails- The southernmost hike in the USA is at Fort Zachary Taylor State Park in Key West, connecting the Point Trail, the Fort View Trail, and an stroll through the fort itself. 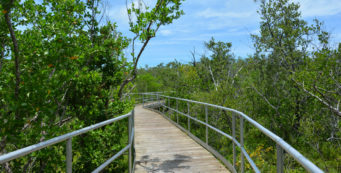 Golden Orb Trail- Showcasing some of the Florida Keys more rare and unusual habitats, the 1.2-mile Golden Orb Trail at Long Key State Park swings an arc through the heart of Long Key, ending up at views of the Atlantic Ocean. 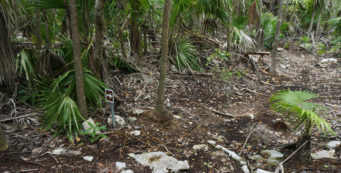 Green Turtle Hammock Nature Preserve- At Green Turtle Hammock Nature Preserve, natural footpaths wind through a rockland tropical hammock on Upper Matecumbe Key, where a rocky crevice emits sulfur fumes and you must beware of a crocodile by the canoe put-in. 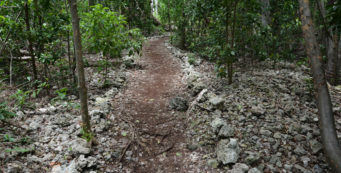 Grove Trail- If you've ever wondered where Key limes came from, take a walk on the 0.5-mile Grove Trail at John Pennekamp Coral Reef State Park to see of one of the historic groves of Key Largo. 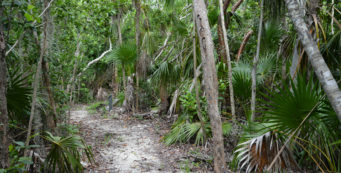 Hammock Trail- In a tropical hammock, learn about the trees of the Florida Keys with a walk on the 0.6-mile Hammock Trail at Windley Key Fossil Reef Geological State Park. 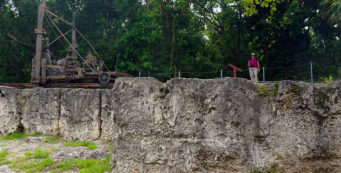 Indian Key Historic State Park- The original seat of Dade County, settled in 1836, lies in limestone ruins swaddled in a tropical forest within sight of US 1, but offshore. 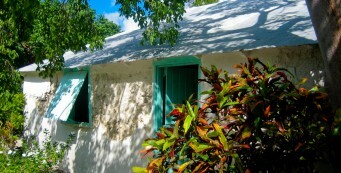 Indian Key takes a little planning to visit, but is well worth the journey. 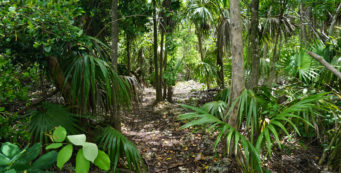 Key West Tropical Forest & Botanical Garden- With boardwalks and natural footpaths winding amid curated collections against a backdrop of natural Florida Keys habitats, the Key West Tropical Forest & Botanical Garden is a delightful natural destination. 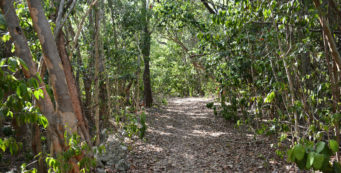 Layton Trail- At Long Key State Park, the Layton Trail leads you on a quarter-mile exploration of mangrove forest and tropical hammock on the shores of Florida Bay. 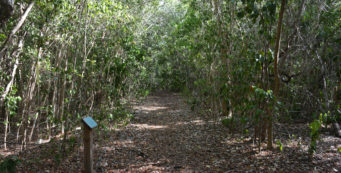 Lignumvitae Key Botanical State Park- Wrapped in a dense blanket of mosquitoes, Lignumvitae Key Botanical State Park is one of the United States' most significant botanical treasures, a virgin tropical forest home to more than a thousand lignum vitae trees. 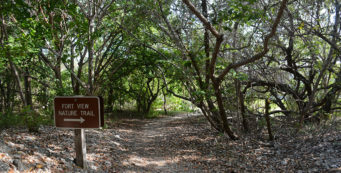 Little Hamaca Park- A preserve along the historic Key West Salt Ponds, Little Hamaca Park has a boardwalk and footpath leading through a cross-section of the island's habitats. 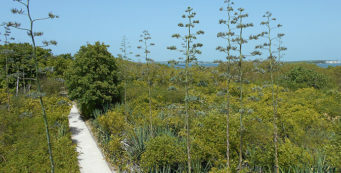 Long Key State Park- Spanning shore to shore across much of its namesake island, Long Key State Park offers a bounty of botanical wonders across a variety of rare Florida Keys habitats. 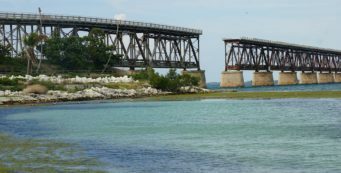 Old Bahia Honda Bridge Trail- Stand above Bahia Honda State Park and take in a sweeping view from one of the highest points in the Florida Keys: atop the Old Bahia Honda Bridge, built in the early 1900s. 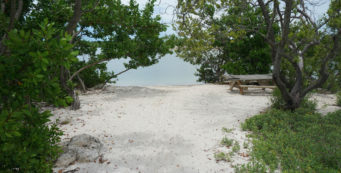 Plantation Hammocks Preserve- Adjoining Founders Park on Plantation Key, Plantation Hammocks Preserve showcases some of the Florida Keys most interesting flowers under a generous canopy of well-established tropical trees. Silver Palm Trail- CURRENTLY CLOSED THROUGH 2019. 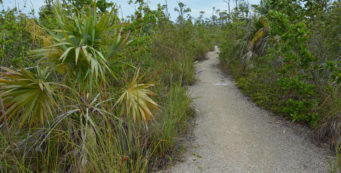 Along the Silver Palm Trail at Bahia Honda State Park, you'll meander through the largest grove of silver palms (Coccothrinax argentata) in the United States. 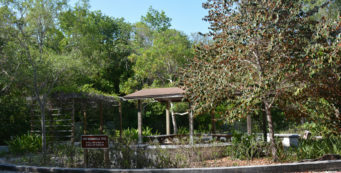 Sonny McCoy Indigenous Park- Within sight of the Atlantic Ocean, Sonny McCoy Indigenous Park is a rare patch of green space in the city of Key West, with native trees and a natural freshwater pond. 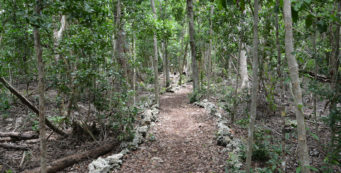 Wild Tamarind Trail- Tunneling into the deep shade of the Key Largo Hammock, a tropical forest that once covered most of the uplands of this island, the Wild Tamarind Trail provides you a close-up look at the trees and shrubs that make up this not-so-common forest. 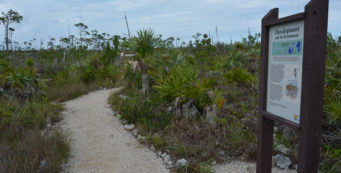 Windley Trail- A short interpretive loop at Windley Key Fossil Reef Geological State Park, the Windley Trail circles through a tropical hammock before descending to showcase the fossil-rich rock walls of the quarry. 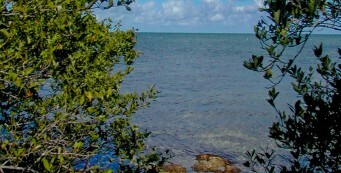 Nearby: Biscayne Bay, Biscayne National Park, Everglades National Park, Homestead, Miami. 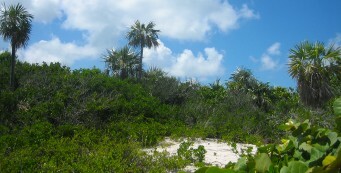 Welcome to America's tropics, a string of islands off the peninsula's tip stretching nearly 130 miles. Home to dense tropical hammocks and mangrove-lined shores, it's a destination where virtually everywhere you stop has a waterfront view. 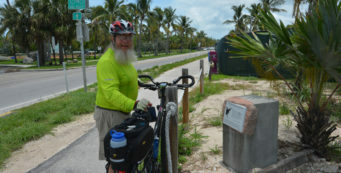 Running the length of the Keys, the Overseas Heritage Trail paralleling US 1 offers cyclists and walkers stretches of scenery along paved trail segments and former highway bridges. 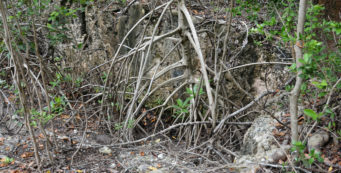 Before you go walking in the woods in the Florida Keys, learn about Florida's most dangerous trees - the poisonwood and the manchineel. 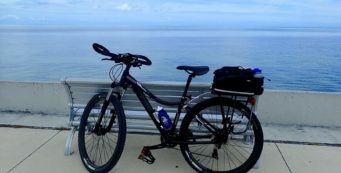 The Overseas Highway is arguably Florida's most scenic drive as you stare out over the shimmering turquoise waters of the Atlantic Ocean and Florida Bay, cradled inside the protective wall of a living coral reef miles offshore. 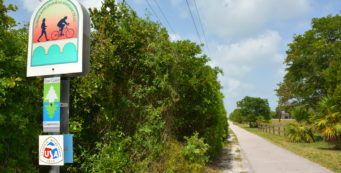 Driving US 1 to Key West, you'll note that directions are expressed in "MM"(mile marker) signposts along the highway, which makes it easy to find your destination and figure out how far it is from where you are now. What you don't have any control over is that there is just one road, so traffic - especially when you want to make a left turn - can be a real problem at times. Don't expect to be in a hurry here. You're virtually in the Caribbean, and this is island time. Resorts are the norm in the Florida Keys, and prices are steeper than on the mainland. Our favorite romantic getaways include the intimate Kona Kai in Key Largo and the beautiful Key Lime Inn on Key West, set in a tropical forest. 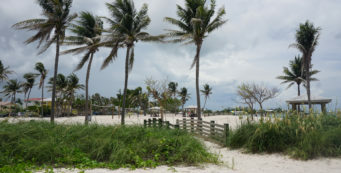 Others we've stayed at and enjoyed include the Chesapeake Beach Resort in Islamorada, the Key Largo Marriott Beach Resort, and Parmer's Resort on Little Torch Island. Budget travelers can still find retro motels along US 1 without much effort, and in Key West along South Street, including the famed Seashell Motel & Key West Hostel, one of Florida's few hostels, with both bunkhouse and private rooms. Campers pay more of a premium in the Keys than anyone else. 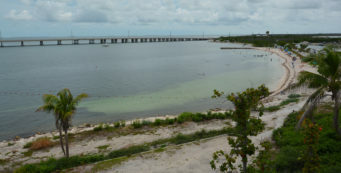 Although Bahia Honda State Park offers spectacular waterfront tent sites, they book up a year ahead. 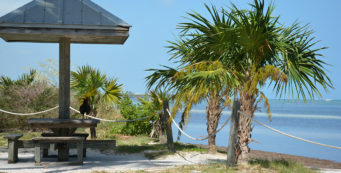 RVs are not allowed to park on the streets of Key West, but you'll find Boyds Campground on Stock Island a nearby place to call home. 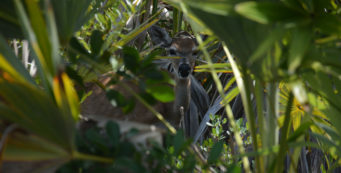 Two off-the-highway gems we found are the Geiger Key Marina on Geiger Key and Lazy Lakes RV Resort on Summerland Key. 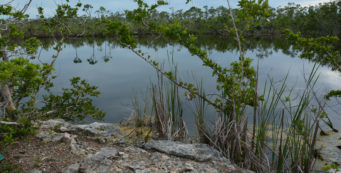 Crocodile Lake NWR- Protecting more than 6,700 acres of Key Largo to provide prime habitat for the endangered American crocodile, Crocodile Lake NWR has a small visitor complex where you can learn about species conservation at the refuge. 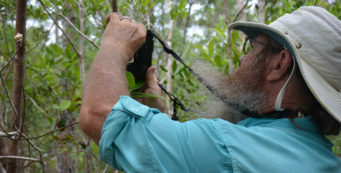 Curry Hammock State Park- Bring your binoculars for fall birding at Curry Hammock State Park, where migrating raptors cruise overhead by the hundreds following a major flyover route. 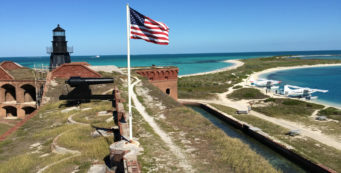 Dry Tortugas National Park- Our friend Bob "TruckrBob" Finley shares his experience with planning, and reaching, the toughest park to visit in Florida: Dry Tortugas National Park, 70 miles offshore from Key West. 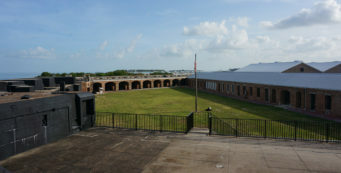 Fort Zachary Taylor Historic State Park- Once the grand sentinel that protected the fledgling town of Key West from attack, Fort Zachary Taylor is still an imposing presence from the sea as sailboats - and monster cruise ships - pull into port in downtown Key West. 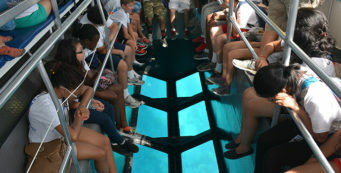 John Pennekamp Coral Reef State Park- Six miles offshore, the view is beneath the waves. 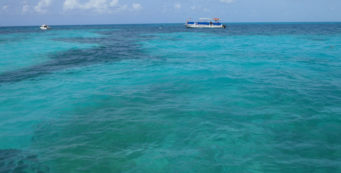 It's Molasses Reef, the most accessible living coral reef in the United States, a slice of the Caribbean in the Florida Keys. And it's the main reason that John Pennekamp Coral Reef State Park exists. 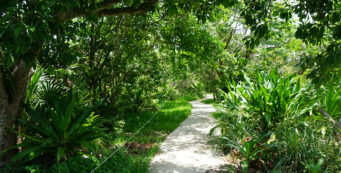 Key Largo Hammock Botanical State Park- A botanical treasure rescued from developers, Dagny Johnson Key Largo Hammock Botanical State Park has the highest concentration of National Champion trees in the United States. Windley Key Fossil Reef Geological State Park- Preserving a patch of tropical forest surrounding a quarry opened in 1908, Windley Key Fossil Reef Geological State Park showcases the uniqueness of the Florida Keys in both botany and geology, with vast slabs of coral frozen in stone awaiting your inspection. 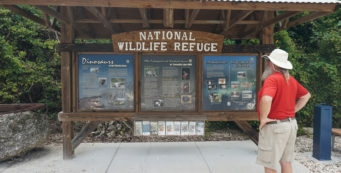 The Florida Keys, Revisited Jun 2018- Nine months after Hurricane Irma, we headed to the Florida Keys to see how both the infrastructure and the natural areas are healing. Here's an overview of what we found, from Key West to Key Largo. 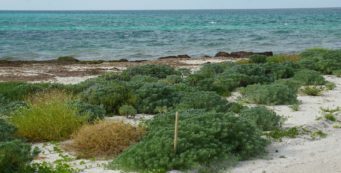 Dry Tortugas National Park Apr 2017- Our friend Bob "TruckrBob" Finley shares his experience with planning, and reaching, the toughest park to visit in Florida: Dry Tortugas National Park, 70 miles offshore from Key West. 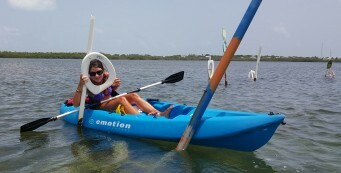 Kayaking Toilet Seat Cut In Islamorada Oct 2015- On the Florida Bay side of Tavernier, a paddling trip to Toilet Seat Cut will have you laughing your way down the channel, as contributor Tamara Scharf explains. Adding to the Life List Jul 2015- Although John is a native Floridian, our research trip to South Florida became an opportunity for him to see many natural "firsts" in Florida that most people have on their life lists. Cuban chugs in Key West Jul 2015- Sometimes we take history for granted. A walk through the Key West Tropical Forest & Botanical Garden led to a collection of Cuban chugs, which we didn't know what they were until we learned their story. 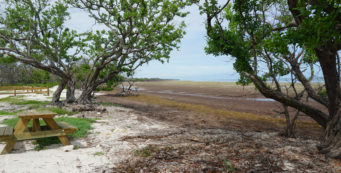 Key West Au Naturel Jul 2015- On a recent visit to Key West, we sought its natural side - what it looked like before it became a city. And since it's been a city for more than 150 years, it takes a bit of sleuthing to find natural habitats. Paradise, Palms, & Mosquitoes Sep 2006- Our very first exploration on the hiking trails of Marathon lead us to thatch palm hammocks: the Curry Hammock Nature Trail at Curry Hammock State Park, and the trails of Crane Point Hammock, including the beautiful Palm Hammock Trail.